With the advent of IP cameras, it has become a bit more tricky for some people to understand how security cameras connect and how they communicate. In the old days, security cameras were wired directly to the DVR recorder, so connection was pretty straight forward. However, with newer IP security cameras, cameras can be connected right to a home or business network, ANYWHERE on the network. While in reality, this is easier, it is important to know how IP cameras work, and how your network works, otherwise it can get a little confusing. IP security cameras are basically like a computer that you would connect to your network. Unlike previous generation cameras, these cameras have a built-in processor to compress the video and a built in network card to send that video over the network to a computer or NVR recording device. This means, they can be connected to any node (point of contact) on your network. 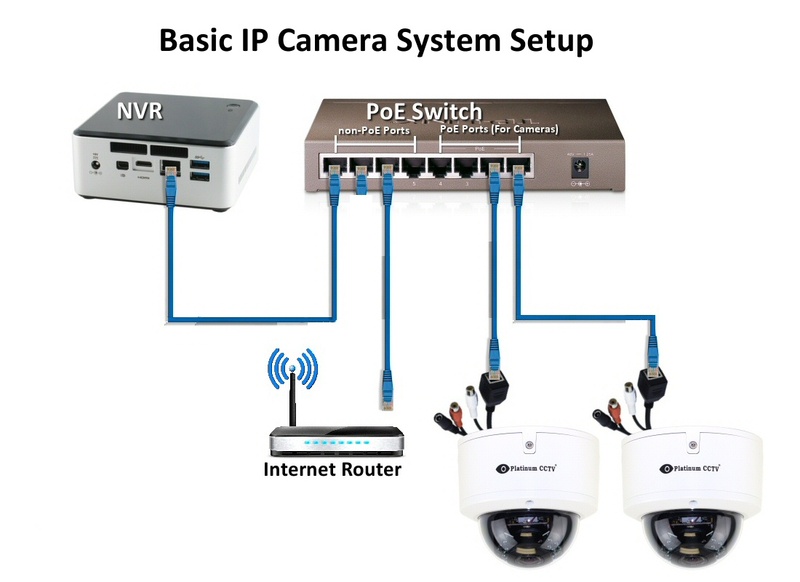 However, this is complicated by the fact that most of today's IP cameras require a special network switch to be connected directly to the camera to provide the camera with power as well (without needing a separate cable for power). This is called PoE (power over ethernet). 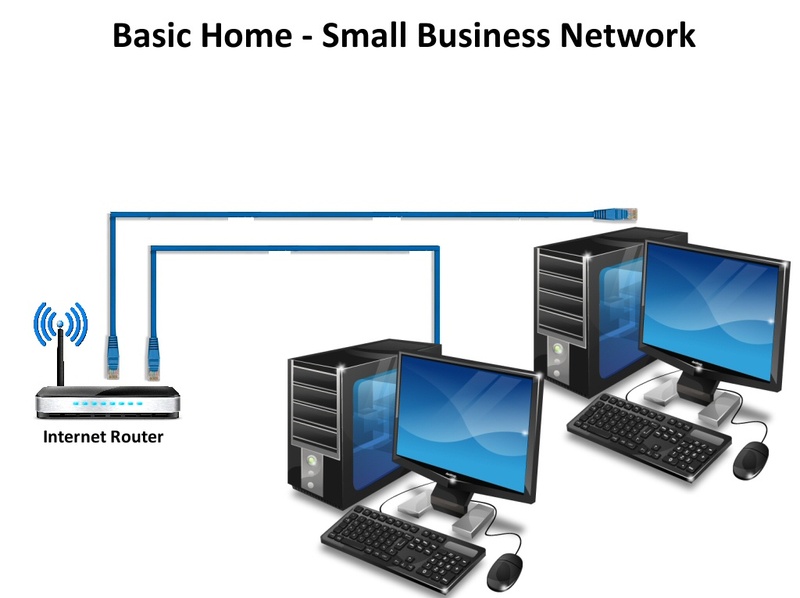 So lets look at your basic home or small business network, depicted here. Each of your computers connect to your internet router (or modem) to provide them with internet connection. Other devices like your laptop or tablet, will usually connect wirelessly with WiFi that is built into that router or modem. Now, we will add in a PoE switch connected to your router, that will allow you to connect your IP cameras and NVR to your internet connection. This diagram shows the most basic of IP camera setups. Connecting your cameras in this fashion represents how approximately 75-80% of people set up their security cameras. However, later we will look at an alternate configuration that we prefer for installation, as it will provide better security for your cameras. With cameras in this configuration, we recommend setting up the camera on a virtually isolated network. This means that even though the cameras are physically connected to the internet, they are not allowed (electronically) to connect to the internet directly. For those tech geeks in the crowd, yes we are basically using our own term for something you already understand. But this is more for the novice to networking, to help them understand better. Basically, how we configure this network for our customers, is to isolate the cameras onto a network that no other computers or devices can contact. By putting the cameras onto their own subnet they are untouchable by any of the computers that are on your network, and also are prevented from contacting the internet directly. Only the NVR will have access to this network, by setting it to have a dual IP. Note: all of our AVM system NVRs or PCs running our AVM software will be able to use this configuration, but cheap Standalone NVRs do not have this capability. It is important to isolate your IP cameras, as many IP cameras have built-in P2P access which means they are trying to contact random internet servers all the time, to allow a convenient direct access to the camera. Convenience and security are often mutually exclusive, as is the case with this type of access to IP cameras generally. 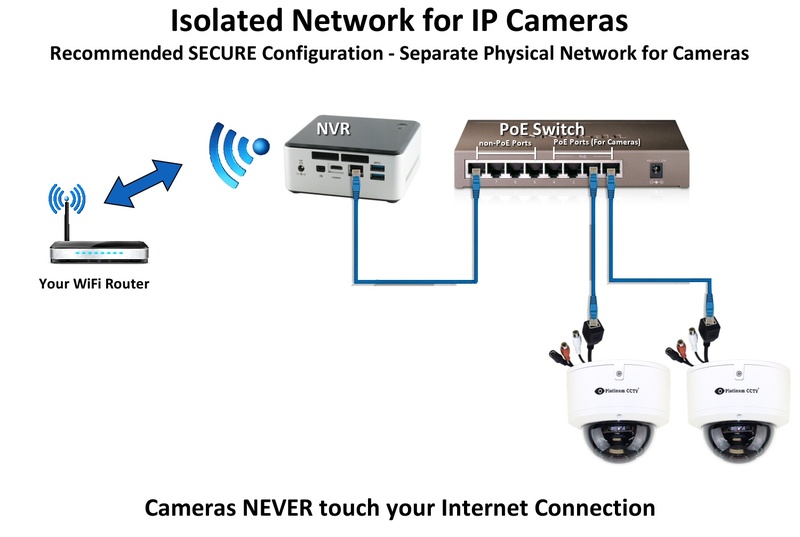 see our previous articles on IP camera security breaches By isolating the cameras virtually as we have discussed, you can still operate with the cameras anywhere on your network, without anyone on the network from even knowing that the cameras are there, and not being able to access the cameras directly. This is the configuration that we highly recommend, when it comes to configuring your security cameras for best security. The cameras are placed on a completely isolated network, with no computers (aside from the NVR) connected to the network at all. All cameras run to the PoE switch, and the PoE switch connects to the NVR. You can still access your NVR over the network though, as the NVR is then connected to your existing WiFi. What's the Difference though? The difference is that the PC is using 2 entirely different network cards, one for connecting to your internet connection (the wireless or in some cases a separate wired NIC) and the other for connection only to the camera network. This means that no cameras ever contact your internet connection directly, so these cameras cannot be accessed by anything except the NVR. This is the ideal setup, and the setup we employ most often for our customers who are installing IP security cameras (both locally and throughout the country), because if offers the best security for your camera feeds, while still allowing you access. Combine this with the added security alerting features of the AVM NVR system, and you will have the best security to ensure your cameras are always recording and secured from prying eyes. Hopefully this helps you with connection and network layout for your new IP camera system. There are many different ways to connect systems to the network, so if you have questions about connecting our IP camera systems, that is why we are here to help! Just call us at (866) 537-5438 or click on the chat in the lower right of the screen. Find our what our AVM systems will do for you. Nice article and very useful too. With the increase of security threats like criminal activities, thefts etc, video surveillance becomes more and more popular. Strantin uses the latest technology to give you the tools you need to protect and prevent. Very usefull article. In your recommended Physically Isolated Network, if I want to connect the NVR to the Modem/Router by cable, then I will need a NVR with two Ethernet ports, one for the power switch and one for the modem/router, right? Thank you.